This is where all the action takes place... It's an 10x12 pump house that someone finished out many years ago. There is a trap door in the floor to access the well head and a pressure tank in one corner. Termites have been very active over the years. I suspect that without the redwood siding, it would collapse. In the foreground is an old Tri-ex 72 ft crankup. All cables are fed through the copper entrance panel on the wall. Above the window is mounted a 2m/70cm vertical. 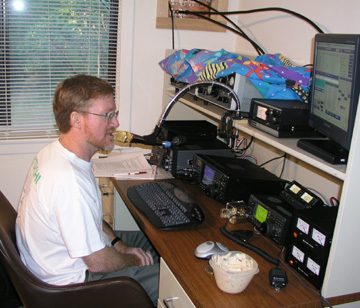 This is Dave W8NF at the operating position during the 2003 California QSO Party. A few things have changed, but I don't have a more recent picture yet. If you're wondering why Dave looks somewhat like a deer in the headlights, he's a CW man working SSB. 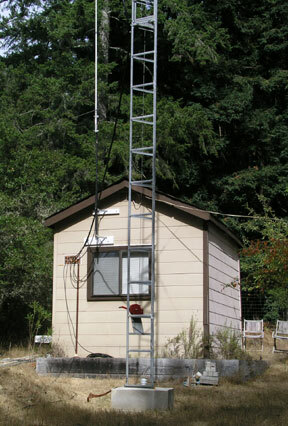 The HF/6m rig is an Icom 756PRO. Out of the picture are the computer, PW-1 amplifier and trusty beer-fridge. Incidentally, the Logitech cordless keyboard and mouse were only in use for a few weeks. They were not well behaved around RF.